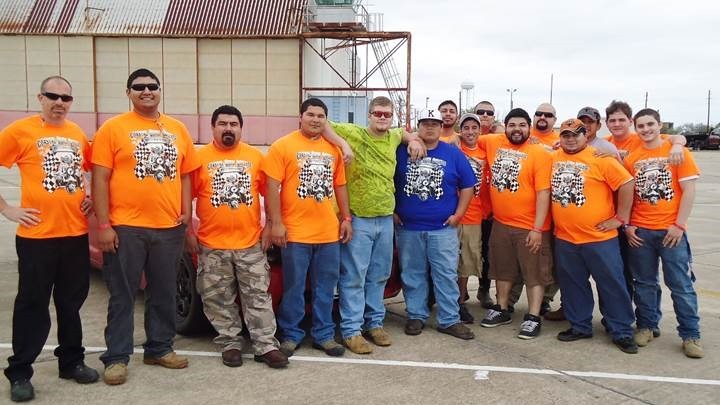 Coastal Bend College automotive students participated in the Texas Mile event at Chase Field this past weekend by helping inspect over 80 automobiles and assisting with traffic control. This marks the fifth time the CBC automotive students have helped in the twice-a-year event, and the experience provides them with valuable hands-on experience in learning about the other side of the automotive industry. Automotive Instructor Brian Anderson strives to seek out and provide these opportunities for his students to help showcase how broad a career in the automotive industry can be. “I enjoy seeing my students get excited about assisting in events such as the Texas Mile. The experience helps them see what they can look forward to after graduating from CBC, and the Texas Mile is a good way for all of us to work together outside the classroom environment. I instill in my students that hard work and good work experience can help them go far when they embark on their careers in the automotive industry,” Anderson said. Pictured above are, from left to right, CBC Automotive Instructor Brian Anderson, along with CBC automotive students Gilbert Cruz, Richard Villarreal, Jonathan Flores, Stephen Henderson, Daryn Shultz, Timothy Barcenas, Jose Molina, Jonah Puga, Michael De Pau; and in the back row, Fidel Torres, Martin Medellin, Mario De Pau, Marc Montez, and Darren Blankenship. The CBC automotive program is accepting students for the upcoming 2013-2014 academic year. For more information about CBC’s automotive program, contact Brian Anderson at (361) 354-2528 or via email at bandy@coastalbend.edu.